The world needs me. I'm busy saving the world. 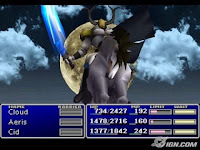 I'm mid-way through Final Fantasy 7, a game that blew me away last time I played it. As soon as I saw it on PSN I know I had to go back and play it all over again. I spent 2 late nights trying to coax PSN to accept my hacked PSP. It was hard, work, but I did it! 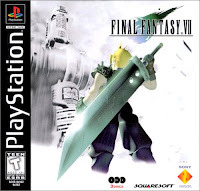 Final Fantasy 7. Great game. I clocked 70 hours when I first played it through the first time around on the PlayStation 1. Now I'm playing it again. I should be loving it, but I'm bored... it's not the same as last time. This time around, it's different. Things have changed, but what? PS1 - Large screen, good sound, non-portable. PSP - small screen, poor sound, portable. I think this is the key problem. I now play the game in totally different situations than previously. The first time through it was only played in the front room. On my own, with a large screen dominating my vision, and with nothing else going on. Playing on the PSP means I can play the game anywhere. This is both a blessing and a curse. It means I can play ANYWHERE! I've played whilst cooking, in front of the TV, whilst on the train... other things are going on around me. I'm not as wrapped up in the story as I once was, my attention is now split between the game and everything else occurring around me. I can also drop out of the game whenever I want. I'm not obliged to listen to this or that cut scene, I don't need to stick with it to the next save point. This problem is made worse because I often play the game without sound, so I don't interrupt people around me. I've removed one of the key affects the game has on me. Without sound I've now got to rely entirely on the visuals for atmosphere. But with a smaller screen as well as other things going on around me it's a lot harder than it once was. I played through the game before, so this time I know what's going to happen. I can't remember the details, but the main arc and twists are still there. The story itself now seems at little melodramatic. The result is that I'm not gripped as I was before. I can put it down and wander off whenever I need to. No more late homework (or work equivalent). A common complaint I know, but the 'summon' spells can't be skipped. Whilst I found this a small price to pay to play the game last time, this time it's infinitely more annoying. Last time I had the storyline unfolding before me, this time I don't want to grind, I want to get to the story peaks asap. Why didn't the designers allow skipping? *sob* I'm a busy (ish) man! I've got no time to wait!